3 Jan. 2018 : High frame rate time code support in version 0.6.1! The typical mistakes of DPX handling applications for time code are ignoring drop frame flag and field bit in the time code data field. The latest version of DPX Analytics supports high frame rate time code with drop frame flag and field bits. NewTek NDI monitoring feature was added from version 0.6.0! From version 0.6.0, NewTek NDI monitoring feature was added. You can see an image that you selected on DPX Analytics by NewTek NDI Tools. Please visit NDI web site https://www.newtek.com/ndi/ for more details. The recommended network settings are shown below. It is using DPX Analytics as a NDI transmitter on a media server. In a typical implementation of a router, The Wi-Fi clients can't communicate each other directly because of a security reason. Therefore, You will using a wired connection between your NDI transmitter and a router.  The NDI video monitors are working on the network simultaneously as NDI receivers for multiple users with NDI broadcasting features. Added the graphical user interface version of the tool! The first version of GUI was released! The supported platforms are Windows(32-bit/64-bit) and MacOS. Some of the DPX files, there are illegal data in their text fields after the NULL termination. To discover this situations we should have full data dump feature and also need to see them as a text string. In the previous all versions, there is a bug in operations of floating point data fields. 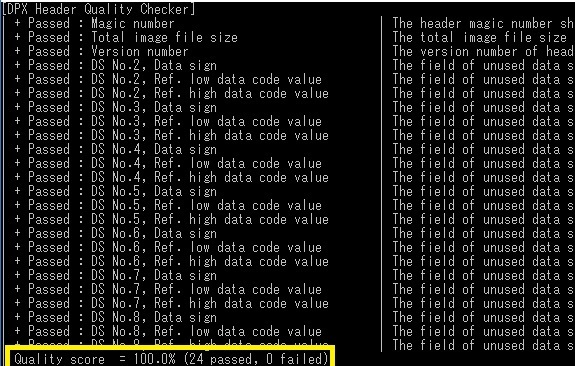 From this version, the quality score indicates the quality of DPX header from the result of DPX Header Quality Checker. The data dump feature for the metadata text fields was added. Sometimes, these metadata fields are broken because the specification of DPX is not clear. The most important thing is that a text field is not a text string of C language. It means we should not use NULL termination for the text string. We have seen some types of the formats for the termination. The previous version 0.0.1 doesn't provide any additional information for the values. For example, the value of the descriptor field have the meaning of the data elements. From the version 0.1.0, the additional information were added for the fields as shown below. The preliminary version of a very unique quality checker was added. Currently, we have only a few checks in the feature but will expand it for other metadata fields. The type of these fields are unsigned int 32-bit. 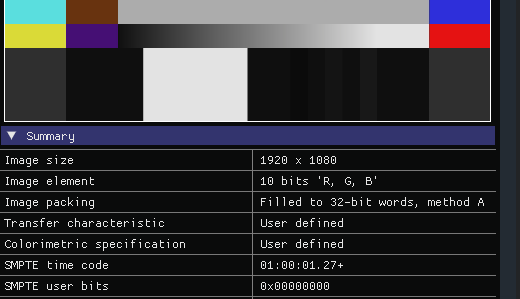 From the version 0.1.0, the tool indicates human readable time code.